Sometimes using phrases like “Exercising Sovereignty”, ” Our Jurisdiction”, “Illegally Occupied Territories”, “Decolonization”, “Indigenous Nationalist”, “Nationhood”, “Warrior Society” “Resurgence of Traditional Governance”, “Autonomy” may seem too militant of terms to use as we gather together and discuss our Peoples History and mobilize within our communities, heck I hear recently the Leadership of a Cree Community in Quebec by use of a Band Council Resolution banned a person from organizing Powwow’s and Sweat lodges http://www.mediaindigena.com so keeping in mind of our people who are not ready for such things here is a passive watered down version of ACTION’s Decolonization 101 Workshops, titled Why did the Chicken Cross the Road? REPUBLICAN INDIAN: It’s true that that white man built those roads for us. We are merely chickens. We will always be chickens until we learn to build those roads ourselves – for profit. TRADITIONAL INDIAN: Those chiggens weren’t traditional because they were supposed to be on it – not crossing it! IHS INDIAN: I really don’t care why he crossed that road. We still aren’t paying for no stinkin hospital bills. BIA INDIAN: They crossed it because of CFR 49, Section 11299, gives them the authority to do so, under Department of Interior regulations, in the Executive Branch. They wrote a grant and we funded them. We are very proud of them. 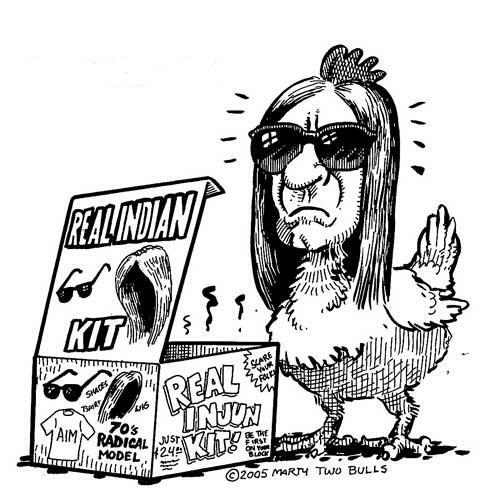 TRIBAL INDIAN COUNCIL: The chicken crossed the road before we did? Fire his family!!! “Let’s not be Chickens afraid to Cross the Road, Too chicken to speak up and take action worrying about what the butcher will think of us or worrying about what the other chickens waiting to get butchered will think. Previous Do non-Aboriginal people have the right to lead Aboriginal struggles?